Snapping Hip Syndrome (SHS), also known as Coxa Saltans, is a condition that is characterized by a snapping sensation, and/or audible “snap” or “click” noise, in or around the hip when it is in motion. There are various causes for snapping hip syndrome, which can be further classified as external, internal, or intra-articular in origin (See Below). For most people this condition is simply an annoyance; however it may result in both pain and weakness interfering with the patient’s functional mobility. Iliotibial band (or “IT band”) snapping over the greater trochanter of the femur. Iliopsoas tendon snapping over a bony prominence of the pelvis. Usually due to a tear of the cartilage and/or loose body within the hip joint that may also cause the hip to “lock up”. Snapping Hip Syndrome is thought to affect up to 10% of the general population. It is thought to occur more frequently in females than men, with external snapping hip syndrome being the most common origin but there is not any statistical proof to show that gender id the risk factor for snapping hip syndrome. The nature of this condition is typically an overuse injury, with a higher occurrence in activities that involve repetitive hip flexion and extension, such as dance, soccer, gymnastics and running. Most cases of SHS are benign and common to the general population. Symptomatic people may experience pain or weakness during hip flexion and extension that limits participation in their activities. Internal SHS also has a gradual onset, not usually associated with a traumatic event. These patients describe a painful sensation coming from deep within the anterior groin as they move their leg from flexion into extension or external rotation. The snapping movement can produce an auditory clunk or click. Patients with Intra-articular SHS report a sudden onset of snapping or clicking from an injury or traumatic event to the hip capsule. The sources of this snapping can come from intracapsular lesions, loose bodies settling in the acetabular fovea or synovial folds, a torn acetabular labrum, synovial chondromatosis, or a history of habitual hip dislocation in children or idiopathic recurrent subluxation. A screen to the lumbar spine and knee to differentiate between any other diagnoses. 1) Ober's test :While the Ober’s test is often used to test for a tight IT Band, its diagnostic credibility for determining an external snapping hip is low. 2) Generally, a clinician can have the patient in side-lying and palpate the greater trochanteric region as the hip moves through flexion and extension followed by internal and external rotation..
3)Brignall et al, used a specific diagnostic test in which the patient is placed on the unaffected side with a pad under the buttock so that the affected hip is held in adduction. Keeping the knee in extension, the hip is then actively flexed and extended and the iliotibial band may be felt flicking over the greater trochanter. 4) Hula-Hoop test: Adduction with circumduction of the affected hip is done to test for external snapping hip syndrome and snap over greater trochanter is positive sign. A version of the FABER test can be used to differentiate between internal (iliopsoas) or external (ITB) generated snapping hip. By placing the affected hip into the FABER (flexion, abduction, external rotation) and passively moving the hip into an extended, adducted and internally rotated position, a palpable or audible snap may be heard. 1)The Stinchfield test: The patient lies supine with the hip flexed at 30° and ask the patient to fully flex the hip, while the examines apply a resistance force. Pain in the anterior groin indicate a positive test. To more accurately diagnose internal and intra-articular snapping of the hip, real-time ultrasonography can be used. This method has replaced fluoroscopy for its direct and noninvasive identification of the psoas and iliopsoas tendons and other hip capsule movements. Overall, it was shown that self-reported snapping hip is likely to be considered a clinical snapping hip. External SHS caused by the ITB can be clinically evaluated, while internal SHS of the iliopsoas tendon should be evaluated via ultrasound. As previously discussed, a majority of Snapping Hip Syndrome cases are asymptomatic and usually don’t require intervention. However, in more persistent cases which cause pain and/or activity limitations, some form of intervention may be necessary. 2010 Pilot Study by Contreras et al. tracked 7 patients for 2 years following arthroscopic surgery related to snapping of the iliopsoas tendon. Patients were referred for surgery between December 2005 and June 2006 after having received no benefit from conservative treatment. Visual Analog Scale (VAS) and Harris Hip scores were recorded pre-op and at 3, 6, 12 and 24 months post-op (clinical significance = 30% reduction in symptoms). All reported resolution of snapping post-op and at 2 year follow-up. VAS scores for pain decreased from 7.7 pre-op to 4.3 by 3 months, 3.6 by 6 months and 2.4 at one and two years. Harris Hip scores increased from 56.1 pre-op to 88.4 at one year and 87.9 at two years. None reported post-op complications and all returned to their previous level of function or better. Compared to the body of literature for surgical management, there is a lack of evidence for specific interventions in the conservative management of snapping hip syndrome and/or tendonitis of the involved structures. Given that this condition is classified as a syndrome, the physical therapist can expect to find multiple abnormalites, each of which should be individually addressed. Examination findings of each individual patient should guide the impairment-based approach to treatment. It is important that the patient is educated to avoid motions that cause pain and/or the snapping sensation. Once the pain and discomfort have been addressed, and a more complete global hip ROM can be achieved, education to avoid excessive repetition of the offending pattern may help prevent a relapse into acute aggravation. Snapping hip syndrome (whether internal, external, or intra-articular) presents with a multitude of symptoms and a variety of impairments. The cause has not been definitively identified, so specific prescriptions of interventions will need to be based on individual patient presentations. The predominant etiological theory suggests that there is an overuse component that leads to an excessive shortening of the involved structures. Logic dictates that effective conservative management will involve stretching and lengthening of shortened structures, and patient education with respect to avoiding motions that cause discomfort. Once treatment has addressed the patient's primary complaints, a more global evaluation may be performed in an attempt to identify imbalances and limitations that may have led to the condition in the first place. ↑ 2.0 2.1 2.2 2.3 Via AG, Fioruzzi A, Randelli F. Diagnosis and Management of Snapping Hip Syndrome: A Comprehensive Review of Literature. Rheumatology (Sunnyvale). 2017;7(228):2161-1149. ↑ 3.0 3.1 3.2 3.3 3.4 3.5 3.6 3.7 3.8 3.9 Idjadi J, Meislin R. Symptomatic snapping hip: targeted treatment for maximum pain relief. Physician & Sportsmedicine [serial online]. 2004;32(1):25. ↑ 6.0 6.1 6.2 6.3 Winston P, Awan R, Cassicy JD et al. Clinical examination and ultrasound of self-reported snapping hip syndrome in elite ballet dancers. Am J Sports Med. 2007;35:118-126. ↑ Deslandes M, Guillin R, Cardinal E et al. The snapping iliopsoas tendon: new mechanisms using dynamic sonography. AJR. 2008;190:576-581. Available at http://www.ajronline.org/cgi/content/full/190/3/576. Accessed July 17, 2011. 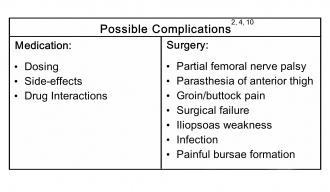 ↑ 9.0 9.1 9.2 Garry J, Jenkins W. Snapping hip syndrome. eMedicine Sports Medicine. 2010. Available at: http://emedicine.medscape.com/article/87659-overview. ↑ Whal CJ, Warren RF, Adler RS, Hannafin JA, Hasen B. Internal coxa saltans (snapping hip) as a result of overtraining: a report of 3 cases in professional athletes with a review of causes and the role of ultrasound in early diagnosis and management. Am J Sports Med. 2004;32(5):1302–1309. ↑ 14.0 14.1 14.2 14.3 Bond RP, Snyckers CH. Management of sports overuse injuries of the lower limb: an evidence-based review of the literature. SA Orthop. J. 2010;9(2):48-58.